Someone once rightly said, “A nation’s culture resides in the hearts and in the soul of the people and there must be food for the soul”. India is diverse in several aspects, be it culture, religions, people and even food. Hence, many festivals are celebrated here with great pomp and show. Indian cuisine is also quite diverse and is liked by foodies from all over. From salads to sausages, vegetarian to Non-vegetarian, Murg Raseela to piping hot Rasam and even varieties of bread to desserts, India has all to offer. The Oberoi, Bengaluru decided to take us on a gastronomic journey “Food Bazaar” across India, this Independence week. The corporate head Chef, savouringParvinder Bali, has introduced an amazing array of India’s street food from various parts of India. 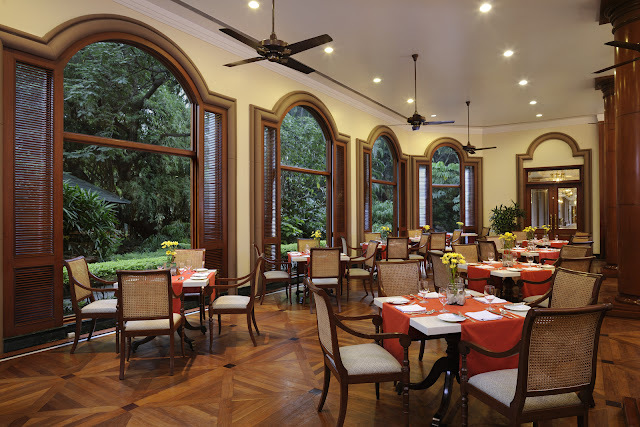 From food to outdoor décor, restaurant ‘Le Jardin’ , a colonial style restaurant succeeded in providing the perfect feeling of hanging out in the lanes of different parts of our savoring the delicacies. The open stalls and sounds of trucks and rickshaws in the background was making the idea more realistic. The purpose of displaying the outlet “Food Bazaar” is to symbolize the diversity in Indian cuisine and also complements the Independence day celebration. Born and raised in Baramulla, Kashmir, chef Bali followed a hands-on culinary degree at Institute of hotel management, Kolkata, in 1993.He was also bagged a gold medal at the Oberoi Culinary Olympics held in 1996. Before being crowned the chef of the prestigious hotel ‘Oberoi’, he dreamed of a neuro-surgeon, but later enrolledfor Mechanical Engineering in Regional Engineering College, Kashmir. However, it seemed like he was destined to be a chef. Bali started his career in the pastry kitchen of‘The Oberoi’, New Delhi and today he is the Corporate Chef in the Oberoi Centre of Learning and Development. He is one among the golden three who has been professionally certified by ‘Culinary Institute of America and American Culinary Federation’. Not but the least, he is one of the few chefs in the world who had scored highest marks in Pro Certification Level 2, until 2014.Bali’s culinary journey took him to a roller coaster ride and he savors every bit of it. Bali’s love and knowledge about food is phenomenal. “I didn’t know when I fall for the burning stoves in the kitchen, love doing the dishes and of course cooking”, Bali stated off with a pleasant smile. He took me on a stroll to the streets of almost every part of India- be it Kolkata, Mumbai, Old Delhi, Hyderabad or Tamil Nadu and I must say, the street food adventure was rejuvenating for both my body and soul. Shikanji, which is commonly known as “NimbuPaani” mixed with a tinge of spices,was how I was welcomed. It truly represents a refresher and serves the purpose of welcome drink. To begin with, I have chosen “chaats”- which is very unique to Indians. The Gol Gappas stuffed with boiled potatoes, chickpeas sprinkled with chaat masala have been presented with different flavours of water- fresh mint, kokkum and roasted pine apple all ready to pop in to my mouth. Prepared with a mix of moong and uraddaal, manually blending it for couple of minutes and soaking it overnight in curd, resulted in the softest “Dahi Bhallas” on my plate. Next what grabbed my attention was the “Palak Patta Chaat”.Palak, in general is not loved by many- except the health conscious ones. This preparation helped me understand a new purpose of Spinach (Palak). Coated with four different types of flours viz, Ground chickpea (Besan), all-purpose flour, rice flour and cornflour, the Spinach leaves directly get into the frying pan, serving a crispy bite. Garnished with pomegranate seeds and “Sev” at the top, the whole “Palak Patta Chaat” totally floored me. One can even try their cold offerings such as crispy mini idli, Karela (Bittergourd) and Brinjal Salad, BesanDhokla and Jaitoon Khandvi in their starters. I couldn’t resist myself from seeing the spread of their conglomeration of Street food. It was time to taste every region of India. I ordered for lamb rolls, the lamb pieces just melts in my mouth and the bread feels so good. If you are vegetarian, they have “Paneer rolls” to offer and who wants a substitution for lamb, one can ask for a chicken roll! The word “Chop” (cutlets) reminded me of Kolkata, the city of joy where food is considered divine. The Beetroot chop and Machlicoorkitmasked with bread crumbs and served with “Kasundi”-a form of pickle made of dried slices of green mango preserved in mustard and salt; succeed in providing the essence of streets of Kolkata. I am sure if one is taking this preparation back home, this will prove to be a perfect combo with strong “Chai” this monsoon. Shallow roast with a generous amount of butter, Pav Bhaji took me to the ambrosial lanes of Maharashtra. My tummy was more than satisfied but the best are yet to come. The next counter displays the intrinsic part of Karol Baag, Delhi- Chole Bhathure. I couldn’t have afforded to miss this. The Bhathure was prepared by kneading the dough along with an old starter known as levain instead of adding yeast. The presence of levain gave the bhathure an extraordinary texture and white colour which blended easily with the spicy chole (chickpeas) tossed with squeezed lemon and diced onions. South India is well known for its spices. The aroma of cardamom, nutmeg, star-anise, clove and cumin seeds put my nose alert for that special whiff. The counter depicting Hyderabad with its pot cooked Chicken Biryani stood out well. The spices were well balanced and the dish kept my hunger pangs away for couple of hours. 70% of the rice was cooked following the regular procedure and then slow cooked in small pots over the burning coal which gives an authentic smoky flavour to the Biryani. Last but not the least I way down to the tastes of Tamil Nadu. Appam with chicken stew completely echoed the rich culture of south. There is no better way to bring all your either close ones or near and dear ones ones together than with desserts. The mango and pistakulfi, the mini kaju and chocolate barfi, badusha and ping-pong ball sized gulabjamun is crème de la crème to their outlandish menu. Over time, my love of street food has only become stronger. So, to glorify the secret love affair with your street food, drop into the restaurant ‘Le Jardin’ located at ‘The Oberoi’. The celebration will last until 20th August. So, hurry!